Tinder Height Verification: Silly Prank Or Clever Commentary? Every April Fools’ Day, brands vie to nab headlines by pulling off outrageous public pranks. This year’s notable gags include Google claiming to have invented a plant language translator, Spotify giving listeners disco-infused Discover Weekly playlists, and McDonald teasing eaters with milkshake-flavored dipping sauces. But the award for 2019’s most memorable prank goes to Tinder, which shook up the online dating world and inspired heated debate with a faux feature announcement. 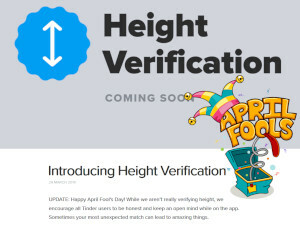 A March 29 blog post introduced the world to the Height Verification Badge, a tool purportedly designed to stop “height fishing” and enforce honesty on the dating app. “Height-lying ends here,” proclaims the post. “To require everyone under 6’ to own up to their real height, we’re bringing truthfulness back into the world of online dating.” The post’s guide to using the feature directs users to input their real height and submit a screenshot of themselves standing next to a commercial building for comparison. Fake screenshots show an error message instructing a dissembling user named Tyler to enter his correct height. Media outlets were quick to pick up the story of the Height Verification Badge. Some immediately identified it as an early April Fools’ Day joke. Others reported the announcement as fact, and Tinder users wasted no time voicing their opinions on social media. Some male users lashed out against the app, calling the bogus feature “a tragedy” while demanding that Tinder introduce a weight verification feature for women. As the body shaming and misogynistic responses rolled in, it became clear that Tinder had done more than pull off prank - they’d also made a point. Lessons learned: body shaming is never ok, honesty is the best policy, and daters shouldn’t be so quick to dismiss potential matches based on superficial dealbreakers. For more on this service, read our Tinder app review.